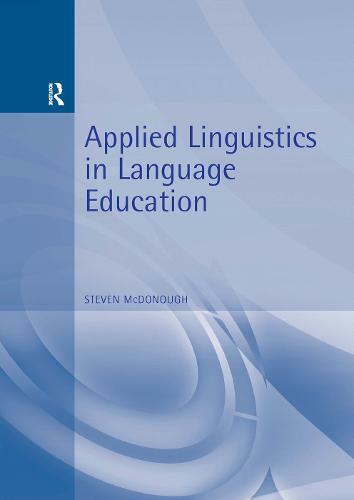 'Applied Linguistics for Language Education' covers those areas of applied language study that are most directly relevant to language teaching, testing, and teacher education. It focuses on the fundamental questions raised for research by the practice of language teaching and research. The reader is thus introduced to the current research climate through consideration of germane controversial issues. If any conclusion about applied linguistic research in the last twenty years is possible, it is that we cannot take anything for granted! Steven McDonough opens with examples of language teaching, teaching materials, and learning a foreign language, which teachers and language learners will recognise, drawing out questions from these which are addressed throughout the rest of the text. Arguments and data from research of all kinds are brought to bear on these and other background issues that are raised, for example: the nature and effects of classroom discourse; the challenges and utility of linguistic theory and linguistic descriptions; what knowing a second language means for proficiency and for processing; nature and nurture in second language learning; how people process language in classrooms and beyond; the role of instruction and the roles of teachers; and measuring achievement. Complex issues are laid out in a clear and accessible style, and many examples are used, mainly, but not exclusively, from English and learning English as a second language. However, the principles apply to learning or teaching any language as a second or foreign language, and 'Applied Linguistics for Language Education' is the most concise overview of current linguistics presently available. The book is a useful addition to the field and fills an important niche. The text itself is well-written, limited in jargon to the essential concepts, sometimes provocatively questioning but with a neutral stance. The amount of information included in this brief volume furthermore gives testimony to the wide knowledge and excellent synthesising skills of its author. Trainee teachers and undergraduate students will find it a pleasant yet stimulating read.